The Contra Costa East Guide Dog Raisers is a non-profit organization of dedicated volunteers who are raising, training, and socializing quality puppies for Guide Dogs for the Blind, Inc. (GDB) of San Rafael, CA. We are one of 149 puppy raising groups for GDB. We were established in 1997 and we serve puppy raisers in East Contra Costa County and the Delta Region. Puppy raisers are a crucial component to the future success of the puppy as a working guide dog. Please explore our website. It will give you a lot of information about what is involved in being a puppy raiser or puppy sitter for our group. 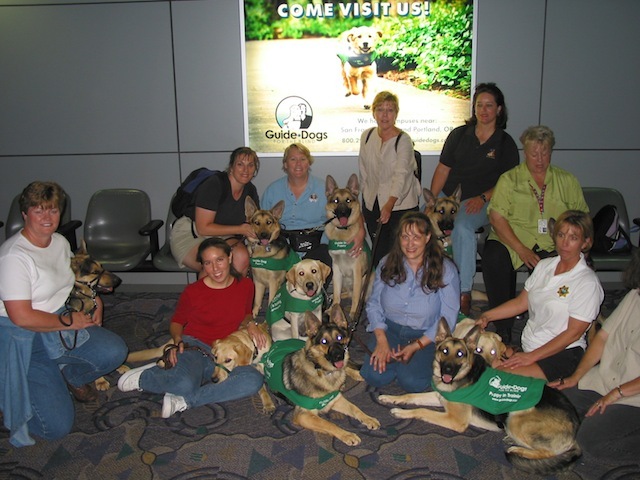 We are extremely proud of our puppies and of our puppy raisers and sitters in all that we do to contribute to the mission of GDB to provide service dogs for the blind and visually impaired. Please contact a group leader by using our online form if you have any questions or if you are interested in becoming a puppy raiser or puppy sitter for our group. Enjoy the website and the wonderful pictures of our puppies and graduate working guides!